Quantum rise was a quiet expansion. It came and went, bringing with it Pilots License Extensions (PLEX). the Orca, and Weapon Grouping (to combat lag). Released on November 11th, 2008 it passed by as CCP moved towards the next release. The API is still new and with Quantum rise they add in certificates and medals. The second CSM is elected and the Alliance Tournament VI is approaching CCP is looking for Military Experts to assist in the broadcast. The quarterly economic report is late. However, CCP releases some statistics about the Orca's introduction to fill the void. The first Orca blueprint was sold on November 11 at 23:30 and within an hour 67 Orcas were in production. Within 24 hours the number of Orcas being produced had risen to 478. The first production job completed on November 15 at 17:07 while the first sale on the general market was on November 16 at 02:38. From November 11 to November 23 a total of 1814 Orcas had entered production. Of those, 1121 ships were completed which means that 693 ships were still in proudction at the end of November 23. Over the same period, 548 Orcas were sold on the market. It‘s interesting to see that during that period 2935 Orca blueprints were sold. This suggests that at least a thousand Orca blueprints were put directly into research rather than production and the number may actually be closer to 2000 since many of the 1814 ships that entered production will be made from the same blueprints . "Eve has sound?" is an in game meme of great age. Yet, here in December of 2008, CCP RealX writes a dev blog about the ten new music tracks that he had added to the game bringing up the total to sixty seven. In general they are planning to pay more attention to the music in the game and update it as they have the graphics and other elements of the game. The Beta version of the Evelopedia is also deployed. Before this there where several player made Wiki out there such as the Eve University Wiki and the Goon Wiki. CCP releases a detailed development blog about Eve's client. They made some mistakes with Quantum Rise that heavily affected performance. They are releasing a fix but have taken the time to discuss some of the technical parts of the Eve Client with the player base. It is January of 2009 and something interesting will happen. Eve's next expansion will arrive in March instead of between May and July. But before that happens, CCP is working on improving graphics while still allowing players to have very low resolution versions of the game that will work on less powerful machines and machines ten years old. However, they are not going to let them keep Eve down. They went to the community and had a pole about the future of Eve's graphics and let the community decide on a reasonable minimum. CCP has signed a deal with Atari to release boxed versions of the game starting with the next expansion, Apocrypha. The current internal setup for CCP allows for each team to be fully autonomous within itself. There are plans to release some internal videos about the workings of CCP so that the player base can see how their game is developed. On January 26th, 2009 CCP Whisper writes a development blog where he explains what is coming in Apocrypha. Wormholes. We are going to give you uncharted, unknown places to visit via paths that shift and slide through the fabric of space. We are going to give you thousands of new solar systems which will contain new NPC's, new exploration content and new pockets of resources to exploit. You will have the chance to venture into places that promise great rewards but also bring with them great risks. We are going to establish the untamed frontier that lurks at the fringes of known space and into which brave souls bent on conquest and riches will venture with high hopes. There are also some familiar names on his development team such as CCP Greyscale and CCP PrismX. NPC Battleships are being added to asteroid belts. They will be in low sec and null sec with no battleship sized rats appearing in high security space. The 24 hour queue will be a game changer for Eve. The player base is quite happy creating a twenty five page thread on the forums. Some players feel that it is not long enough and ask for a longer skill queue while others tell them to be happy that they are getting anything at all. However, with the next expansion CCP is dropping their support fo Linux. It is due to the lack of usage of the Linux client. CCP also details a POS exploit that was fixed and how and why it worked. It is interesting reading for those who want to know about the current POS code. But, really, what about the new spaceships? Sure, bugs, exploits, history, queues, are nice and all but new fancy spaceships! T3 or Strategic Cruisers are going to be something new and different. They will have subsystems that allow them to change out what they do making an incredibly flexible ship. Along with them comes a new fitting screen. It is almost, but not quite what we currently have. This was created due to the need for new fitting screen options thanks to the introduction of the T3 ships. They didn't want another spreadsheet type window and instead made something attractive and a bit more intuitive. Chribba found it a bit hard to use compared to the old way, but he figures he'll get used to it. In general, people are pleased that we are getting saved fittings that we can just load up. But really, the old fitting screen worked perfectly. and CCP is wasting its time creating this and forcing people to look at the ship model. With wormholes and the new T3 cruisers, production must also be considered. Reverse engineering is introduced. The New Player Experience is changing. Eve is a game where you can do and fly anything. Extra steps in the new character creator are removed. Instead of picking a career before they know what the game is about players will get a taste of several possible career paths so that they can decide how they want to play. Skill points are reduced from 800k to around 50k. However, CCP is bringing in the ability to respec your attributes. New players will get two and yearly, everyone can do this. It is a push towards a more sandbox way to play. What does Apocrypha even mean? How do you pronounce it? CCP released a video that touched on the struggle of pronouncing Apocrypha. Per Wikipedia Apocrypha are statements or claims that are of dubious authenticity. Along with this they release videos introducing the four new races. He also discusses adding the new Sleeper NPCs and their new AI. It is near the end of February. Apocrypha is right around the corner. CCP CAPSLOCK explains that they are working on the NPC AI. They want PvE combat to be more like PvP combat. They are not going to change very AI in the game just yet but they are going to start with wormhole NPCs with a goal to make them more scary. February 24th, 2014 CCP releases a teaser for Apocrypha. 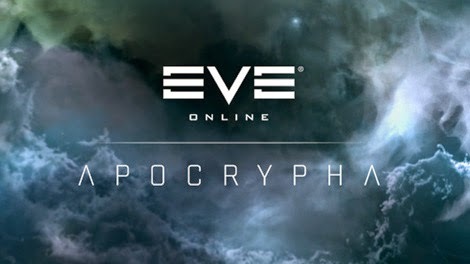 CCP is introducing the first of the Epic Arcs in Apocrypha. These are missions that are outside of the normal missions of the game. Mission windows, dialog and behaviors are changing. However, Epic Arcs are going to be different and should help excite bored mission runners with some revitalized game-play. Back with the change to the New Player Experience, CCP is also going to reduce the skill points that new players start with. This made people mad. However, a week before launch they release a developers blog in which they explain that skills will train two times faster until a new player reaches 1.6 million skill points. This was chosen so that there is only about a six week gap before pre and post apocrypha characters when it comes to their basic usefulness. The player base is not impressed. and predict that new characters will be useless and unable to play leaving Eve in droves due to the boredom before they even start. Russian and Japanese localization have been released onto Sisi. At the same time, asteroids are becoming prettier. Before Apocrypha's launch, CCP does a series of developers blogs. CCP T0rfifrans - Discusses new features and the New Player Experience. A detailed developers blog is released about wormhole space. The terms k-space and w-space come into play. The wormhole effect is first seen and wormhole masses are explained. Wormhole effects are live. No sov can be claimed in wormholes but they will allow people to anchor POS towers if they so wish. Close to my own heart, new exploration sites for boosters are released. These are illegal laboratories owned by the pirates. They are also bringing the higher grade booster gas to low sec. Before, it has only been available in null sec. Along with the new wormhole sites, 320 new exploration sites are entering the game. The third CSM election is about to start. The CSM at this time serves for six months. With wormholes and 320 new exploration sites CCP is also touching on the probe scanner and scanning itself. They write a roleplay blog. However, details are down at the bottom in normal language. The last developer blog covers a Q&A about the new NPC AI. They touch on questions such as, "Why cannot I use E-WAR on sleepers?" and "can I use my capital ships o them?" But it is now March 10th, 2009 and Eve Online: Apocrypha is released. I started to pay attention to Eve roughly in the middle of the Apoc/Dominion time frame, and joined in about two weeks before the Dominion expansion. Been quite a roller coaster ride, and I'm glad I stuck around. HI there Anon, it has been great learning Eve's past while writing this series. We are still almost three years from my birth. Exxciting times are ahead.